Dr.Lucy Peltz of the National Portrait Gallery has kindly suggested a possible attribution to Hoppner on the basis of a photograph. Professor Brian Allen of the Paul Mellon Institute and David Taylor of the National Trust have both indicated that the portrait “does look quite like Lawrence”. The cautious attribution to Hoppner is based on such factors as the top-lighting of the sitter, which gives his face a strong sculptural quality, outlining his sensual lips and searching eyes, and the scumbled execution of the hair, which resembles portraits of George Canning in Lord Rosebery’s collection, and Sir George Beaumont, in the National Gallery, London. The masterly, impressionistic treatment of the neck scarf and ruff is also characteristic. Together with Reynolds and then Lawrence, Hoppner was the pre-eminent painter of English society at the end of the eighteenth century. To a large extent his style was modelled on the former, while he later experienced an obsessive rivalry with the younger and flashier Lawrence. He was a frequent exhibitor at the Royal Academy, where he was awarded a gold medal in 1782 for his history painting of King Lear, and he became portrait painter to the Prince of Wales in 1789. His portraits of the three royal princesses were exhibited at the RA in 1785, but he was also popular as the leading portraitist of Whig society. Other famous sitters included Lord Nelson, the Duke of Wellington and Sir Walter Scott, as well as portraits of the Duke and Duchess of York which hang in St.James’s Palace. 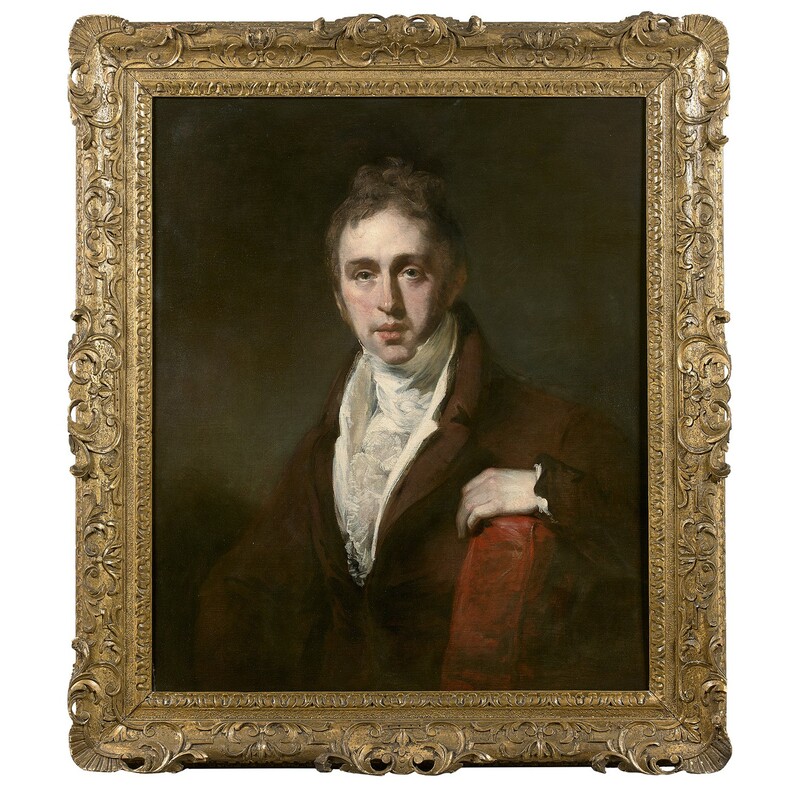 Hoppner was exceptional in giving his sitters a vivid characterisation, achieved by the strong lighting which powerfully models their bone structure, and by placing them against dark backgrounds such as a dramatic red curtain. Many of these elements are seen in the present portrait of a sensitive and distinguished gentleman, probably executed around the turn of the century. I am writing to enquire about "Portrait of a Gentleman, half-length"